Heavy snow has cut off the Alpine ski resorts of Cervinia in Italy and Adelboden in Switzerland, as stormy weather continues to batter Europe. Italian media report that Cervinia, in the Aosta Valley, is half-buried under 2m (6.6ft) of fresh snow. About 10,000 tourists are stuck there. A similar emergency has gripped Adelboden, where the army was mobilised to clear debris from a landslide. In many resorts the avalanche risk is at level four, out of five in total. The weather jeopardised a World Cup ski race that is scheduled to take place this weekend in Adelboden. The landslide cut the resort's road to Frutigen, Neue Zürcher Zeitung news reports. But reports in Swiss media say the race will go ahead and the authorities are working to repair the road. Ski lifts are out of action in Cervinia because the pistes are considered too dangerous, given the deep snow and avalanche risk. A regional weather service for the Aosta Valley, Meteolodi, tweeted a dramatic photo of the snowdrifts in Cervinia. Archie Cadman-Jones, a tourist in Cervinia, told the BBC: "The main road to Valtournenche is closed due to the avalanche risk. All ways to clear the snow are in action, such as diggers, shovels, snow grinders." A video from Gaschurn-Montafon, in Vorarlberg, showed skiers being tossed around on lifts in blizzard conditions. It was posted on the Austrian Facebook site Aktuelle Wetterwarnungen on Wednesday. In Austria's Tyrol region, the avalanche risk is high too and many roads are blocked. In Vorarlberg it is at level four. In the French Alps, ski pistes have been closed at Val d'Isère - one of the biggest resorts - and Chamonix has stopped most of its ski lifts. Storm Eleanor caused havoc in many parts of France, disrupting air and road traffic and cutting power to thousands of homes. 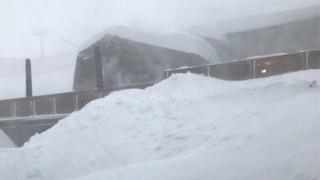 Three people died in the storm in the French Alps: a 93-year-old woman whose home was flooded in Isère, a farmer buried by snow in Savoie and a skier killed when a tree toppled in Morillon. This week winds reached up to 160km/h (100mph) in the UK and 147km/h in France. Are you in any of the resorts affected by the heavy snow? Share your story with us haveyoursay@bbc.co.uk.